In June this year, Melic - the London based kiwi four piece finally come home on a whirlwind tour, bringing their energetic live show to Auckland, Hamilton, Tauranga, Wellington and Christchurch. Formed in London in 2008, this eclectic group of musicians have since recorded three EPs and performed at many venues and festivals in the UK, alongside the likes of INXS, Shihad, I Am Giant and Katchafire, to name a few. The single ‘Nowhere I’d Rather Be’ has been on The Rock FM for the last few months and the official music video can be checked out on YouTube (www.youtube.com/melicband). 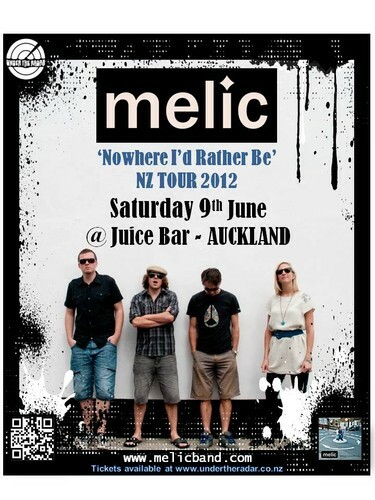 9th June: Juice Bar (Auckland).